BPH is the most common benign disease in aging men, which has a significant impact on their urination. The incidence of this condition is increasing with aging and the classic clinical presentation of it is the lower urinary tract symptoms (LUTS), which has a serious impact on the quality of life of elderly men with the progression of BPH . The prevalence of the patients with clinical symptoms reaches approximately 25%, which interferes with the daily activities and quality of life of them, causing them to seek for medical or surgical treatment. Furthermore, if there is no correct and timely treatment, BPH will damage the upper urinary tract, causing renal inadequacy . So far, transurethral resection of the prostate (TURP) has been considered as the gold standard for surgical treatment of patients with BPH. However, TURP also has a certain risk to elderly patients with cardiovascular and cerebrovascular diseases. Therefore, it is necessary to seek for a safer, more effective, minimally invasive and relatively more inexpensive surgical management for BPH. In addition, all the methods are actualized by removing the gland tissue at present. There are no effective means for those patients who want to keep the prostate organ or those who have poor tolerance to conventional surgery and anesthesia. TUCBDP is a new technology for the treatment of BPH in recent years because of the following advantages: gland preservation, shorter operative time, higher safety. In this paper, the research progress and clinical application are as followed. Burhenne  and colleagues performed transurethral dilation of the prostate (TUDP) on animal experiments and clinical researches as early as 1984. Application of balloon dilation to patients with BPH was first reported in the United States in 1987 by Castaneda and coworkers . At that time, it was thought that there might be no histological effect from urethral dilatation on the urethra or prostate, which may lead to poor long-term outcomes. Accordingly, an in-depth investigation into this operation from domestic and foreign scholars had been delayed. In the 1980s, TUDP once was popular around the world as a simple operation, which is safety and does wonders for patients with BPH in the near future. However, TUDP had been gradually abandoned as a treatment for BPH due to the uncertain long-term results. Jiang  applied a self-designed three chamber high pressure air sac catheter to 91 patients with moderate or severe hyperplasia of prostate in 1993 and achieved good outcome. After that, contributing to the clinical practice, furthermore success has been obtained by improving the design of catheter structure, especially with the development of the dilatation of the membranous urethra. It is a pity that TUDP have not achieved massive improvement yet as the mechanism have not been scientifically explained. The procedure of TUDP is constantly changing and the condition of post-operative urinary incontinence occurs frequently. The organ preserving treatment of BPH has been paid close attention by domestic scholars focusing on dilation of the capsule of prostate, and the research of it has never been interrupted. The balloon catheter of TUCBDP evolved from ellipse, wedge and gourd-shape, and the model included double-cava, three-cavity catheter, and so on. Nowadays, several domestic units have developed the expanding catheter. The team under the leadership of Guo  is the most representative, who is an academician in First Hospital of Peking University. They have investigated this technology thorough from animal experiment to clinical observation since the 90s of the last century. Beijing UNIKITON Medical Technology Co., Ltd. produced a new model of expanding catheter with a internal and an external capsule, and made it the surgical treatment of BPH tend to mature by improving columnar balloon catheter from various aspects. They have produced a variety of four lumen catheters for prostate with different sizes and shapes, and have made the expansion process standardized, and made a scientific explanation for the mechanism of this technology. As the first independent patent technology for the treatment of BPH, TUCBDP has carried out for thousands of cases since the promotion by the annual meeting of the national department of urology in 2015, and most of these achieved good results. To our encouragement that, TUCBDP is being gradually improved along with the continuous improvement and the creation by the team of Guo. Under normal condition, the prostate has a complete capsule in men. As men age, the surrounding growth of prostatic hyperplasia tissue would push itself to the capsule and thick it, which is the formation of “Prostatic Surgical Capsule”. The thicken prostatic capsule would restrict the hyperplasia tissue in the prostate and gradually increase the pressure of urethral, which could influence the urination directly. The enlargement of prostate in men induced by BPH, which can lead to bladder outlet obstruction (BOO), and is the major cause of obstructive symptoms of the lower urinary tract. Lower urinary tract obstruction caused by BPH attributes to the imbalance between the contraction force of detrusor and the outlet resistance of bladder. In other words, dysuria will occur when the outlet resistance increases beyond the contraction force of detrusor . Deng  proposed that many complex factors involved in the urination disorders resulting from BPH. The first mechanical factor is that the pressure of maximum voiding and maximal urethral closure is much higher in patients with BPH, the problem of urination disorders would be resolved if the urethral closure pressure can be effectively relieved. TUCBDP makes it that the posterior urethral pressure is in the lowest impedance state, and forms a new balance in urination by dilating the hyperplastic glands, capsule and bladder neck with a composite balloon. Meanwhile, urinary tract obstruction can be effectively improved for a long period with the expansion of lateral lobe of the prostate and the formation of a pad induced by TUCBDP (Figure 1). 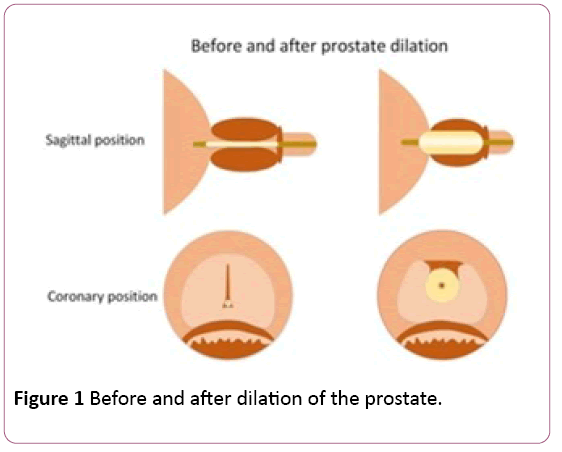 Figure 1: Before and after dilation of the prostate. Zhang  and colleagues reported that the EMG of the urethral sphincter after transurethral split of the prostate (TUSP) was similar to that before TUSP, although the frequency and amplitude of EMG after TUSP were slightly higher. Therefore, the TUSP surgery expanded the urethra while maintaining the normal urinary function and EMG characteristics, which indicates that the proper expansion of the urethra in the membrane does not cause damage to the urethral sphincter or the occurrence of urinary incontinence. The latest production of expansion catheter by UNIKITON Company is the columnar water balloon catheter, which was improved by a large number of clinical practice. At present, this kind of catheter is mainly used in clinic in China because of its simple operation steps. The technical essentials of the surgery are as followed: firstly, the type of expansion catheter is supposed to be compatible with the size of prostate; secondly, the accurate positioning plays an important role in the procedure as well as firm fixation . Now, TUCBDP has been carried out in a number of domestic medical centers and has a great vogue especially in many grassroots hospitals. Zhao  applied it to 26 patients with BPH and all the patients were followed up for 3 months after the operation. In general, the average time of the operation is 10 min, and the mean peak urine flow rate (Qmax), PVR, baseline quality of life (QoL) score and International Prostate Symptom Score (IPSS) have been significantly improved, which were similar to that of Huang . Many research findings like these have revealed that the operation time of TUCBDP is short, and the symptoms of patients with urinary tract obstruction can effectively improve in a short time. According to the research by Bao , who suggested that transurethral balloon dilatation of prostate can alleviate the symptoms and improve the life quality of patients. Nevertheless, the effect of TUCBDP is not as good as that of BPKVP. Zhang  suggested that the former is superior to the latter in improving IPSS, QOL, QmaX, and RUV, comparing the clinical efficacy and related indexes of TUCBDP and BPKVP. With the comparison of the efficacy between TURP and the electrochemical treatment of acute urinary retention caused by BPH, Liu  showed that it is significantly higher in the cure rate of TUCBDP than that of the latter. Combined with the majority of domestic research results, it is considered that transurethral dilation of the prostate is superior to the conventional transurethral resection in terms of the scope of application, the hospital expense, the time of operation, the amount of bleeding and the incidence of postoperative complications. And the short-term curative effect of TUCBDP is good for the former as well as long-term efficacy, Jiang  concluded that patients who have BPH can achieve no recurrence within 3 years with the application of prostate enlargement, and the effective rate was more than 80% within 5 years. Similar techniques have been used in clinical practice abroad. The technology was mainly balloon dilation which was later abandoned. There are essential differences between balloon dilation and TUCBDP because the capsule was not be expanded completely with balloon expansion and a tissue pad was not formed. Therefore, the root cause of inferior longterm effect of balloon dilatation is that BPH mechanical obstruction and dynamic obstruction factors were not completely removed. Now a number of domestic medical units are jointly carried out one multicenter study for the sake of systematic study and clinical observation of TUCBDP, which will provide a scientific basis for the comprehensive promotion of TUCBDP. Transurethral balloon dilation of prostate is a new minimally invasive technique for BPH with the advantages of fewer traumas, shorter operation time, easy to master, and less postoperative complications, which is especially suitable for elderly patients with heart and lung dysfunction or those young patients who want to spare the prostate. At present, there are still some problems need to be solved in the technical aspect of TUCBDP, such as accurate positioning, preventing the expansion of the catheter slip, prevention and control of postoperative bleeding, urinary incontinence. The evaluation of the efficacy of this operation, especially the longterm efficacy needs to be confirmed by long term follow-up of a large number of cases. Na YQ, Ye ZQ (2013) Guidelines for the diagnosis and treatment of diseases in Department of Urology in China.Beijing: People's Medical Publishing House,China.p: 260. Rule AD, Lieber MM, Jacobsen SJ (2005) Is benign prostatic hyperplasia a risk factor for chronic renal failure?J Urol 173: 691-696. Burhenne HJ, Chisholm RJ, Quenville NF (1984) Prostatic hyperplasia: Radiological intervention.Work in progress.Radiol 152: 655-657. Castaneda F, Lund G, Larson BW, Limas E, Urness M, et al. (1987) Prostatic urethra: Experimental dilation in dogs.Radiol163:645-648. Jiang HS, Wei T, Wei RC, Hao TF(1993) Application of three cavity high pressure balloon catheter transurethral dilation for the treatment of benign prostatic hyperplasia.Urol J 4: 235-236. Guo YL (2015) The transurethral columnar balloon dilation of the prostate.Beijing: Peking University medical press pp:75-79. Liu JS, Ma YH, Xu ZG (2008) Urodynamic analysis of 245 patients with benign prostatic hyperplasia.J Xuzhou Med College 28:524-526. Deng JH, Wang LS, Jiang CP (2000) Efficacy of transurethral dilition of prostate for the treatment of benign prostatic hyperplasia.Chin Jandrol14:234. Zhang Y, Zhang ZC, Tian L(2009) Experimental study on the treatment of benign prostatic hyperplasia with composite balloon dilatation.Modern department of Urol magazine 3: 218-221. Chen YG, Qin YH, Gao CX (2009) The clinical application of transurethral split of prostate for the treatment of benign prostatic hyperplasia.Journal of Medical Forum. Zhao KD, Kong DB, Guo ZH, Dawei WU(2016) Clinical observation of benign prostatic hyperplasia treated by transurethral balloon shaped water supply of prostate.Chin J pract med 34: 98-99. Huang WG, Liu F, Zhang D (2003) The treatment of benign prostatic hyperplasia with high risk of benign prostatic hyperplasia by cylindrical water balloon dilation.Jiangsu medical J 17: 256-258. Bao JP (2013) TUDP and PKRP in the treatment of benign prostatic hyperplasia.Chinese J Mod Med33: 41-43. Zhang GF, Wu Y, Wang YJ (2011) Comparison of transurethral balloon dilatation and transurethral plasmakinetic resection of prostate for the treatment of benign prostatic hyperplasia.Chinese JPractical Medicine 15: 2766-2768. Liu JS, Ma YH, Xu ZG(2008) Comparison of curative effect of transurethral prostatic splitting and electrochemical treatment of benign prostatic hyperplasia caused by acute urinary retention.China Androl 8: 50-52. Jiang HS, Zhao HB, Li HF, Peixing AI (2003) Treatment of benign prostatic hyperplasia with a series of high pressure water sac catheter.ChinJ androl6: 256-258.